Tidy Mart is not only deal in trading, of Quartz (SiO2) from India and Sri Lanka. We conform to quality standards which are at par with international standards. Years of experience in this field have given us an edge over others. 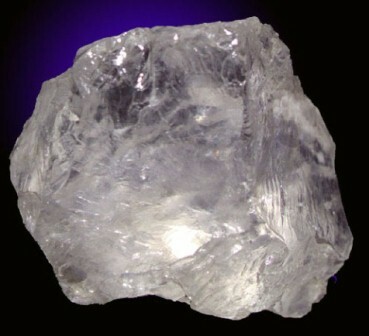 Crystal quartz (SiO2) is a very useful material for fabrication of finished optics: laser beam splitters, AO elements, polarizing optics, prisms, windows, lenses in the ultraviolet because of its high UV, VIS and NIR transmittance, birefringence, ability to rotate plane polarized light, high damage threshold and resistance to scratching. The optical grade material is featured by the highest possible transmittance throughout the range of 190 - 2900 nm, virtual freedom from bubbles and inclusions. Grown boules are Z - crystals and about 100 mm in the direction down the optic axis that limits corresponding dimension in an optical part. Silicon dioxide occurs naturally as sand or rock, and when melted, the resulting product is called Fused Quartz. If the silicon dioxide is synthetically derived, the material is often called Fused Silica. Fused Quartz is very pure, has a high chemical resistance, good thermal shock resistance and is very strong in compression. The low thermal expansion coefficient makes it ideal for mirrors and optical flats. It is used for viewing windows, being transparent to wavelengths from around 0.2 to 3.5 um, insulators for electronic applications and for semi-conductor manufacturing. Silica is manufactured in several forms including fused quartz, crystal, fumed silica (or pyrogenic silica, trademarked Aerosil or Cab-O-Sil), colloidal silica, silica gel, and aerogel. Silica is used primarily in the production of glass for windows, drinking glasses, beverage bottles, and many other uses. The majority of optical fibers for telecommunications are also made from silica. It is a primary raw material for many white ware ceramics such as earthenware, stoneware, porcelain, as well as industrial Portland cement. Feel free to contact us to know more about our professional Quartz & Silica Trading Services. Tidy Mart Offers Customized Quartz & Silica Trading Services.